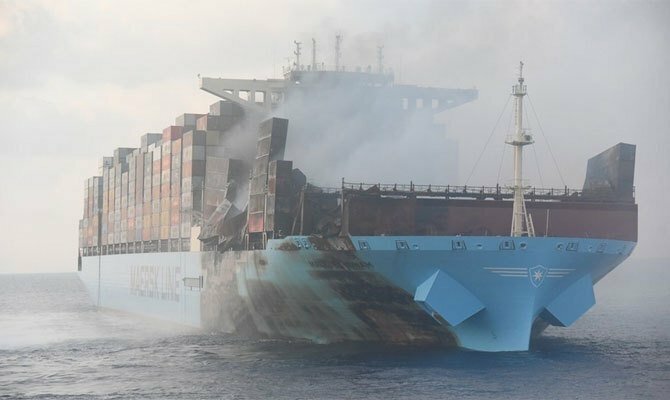 Officials from Maersk Line tell Splash the fire ravaged 15,000 teu Maersk Honam will dock at Jebel Ali in Dubai in the coming days. While saying the fire, which erupted on March 6 in the Arabian Sea, is under control, a spokesperson said there were still a number of hot spots that need extinguishing. “At the anchorage, hot spots in the affected areas will be completely extinguished and further necessary work to bring the vessel alongside will be performed to ensure safe cargo discharge operations and ensuring the stability of the vessel,” the Maersk official said. When these works are completed the vessel will move from anchorage to the Jebel Ali terminal to commence discharge operations. Five seafarers died from the fire, believed to have been a chemical blaze. Investigations into how the inferno started are underway. Maersk did not deserve this. They have been amongst the most active amongst container lines in seeking to establish a system for naming and shaming dishonest shippers of unsafe cargoes. Now five men have lost their lives, and we owe it to their memory that firm action is now taken to put a stop to it – including prosecutions under the criminal law. At the present state of public knowledge of this case, it seems reasonable to think that someone, somewhere, is guilty of endangering human life by failing to safely stow or to declare unsafe cargo, recklessly, with knowledge of the probable consequences. Some legal systems may call that manslaughter.